As the sun sets off Maui, a pair of Hawaiian Petrels calls. Crow-sized seabirds with long, slender wings, the petrels sit at the mouth of their nest burrow, dug high in the rim of Haleakala volcano. To feed their young, adult petrels glide low over the dark ocean, snatching squid from the surface. This foraging flight may take two days, even a week. The petrels fly back to their nests at night, to feed a single chick. Hatched in July, the chick grows rapidly. 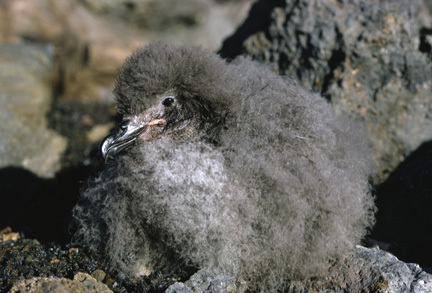 By December, it will be ready to join the adult petrels for a life at sea. The soundscapes featured in today’s show were recorded by Gordon Hempton and provided courtesy of QuietPlanet.com. As the sun sets off Maui, washing the ocean in crimson, a pair of Hawaiian Petrels calls. [“oo-ah-oo” calls of Hawaiian Petrel] Crow-sized seabirds with long, slender wings, the petrels sit at the mouth of their nest burrow, dug high in the rim of Haleakala volcano. One petrel flies out, winging rapidly toward the ocean. [wings] At the coast, it passes over a blowhole, where the sea explodes through a gap in the rocks. The petrel glides low over the dark ocean, snatching squid from the surface. This foraging flight may take two days, even a week. Then the petrel flies back to the nest at night, crossing above the surf line, [surf line] ascending to the mountaintop nest burrow. Here it feeds a single chick. [again, adult with chick] Hatched in July, the chick grows rapidly and in December will be ready to join the adult petrels for a life at sea. “The soundscape[s] featured in today’s show were recorded by Gordon Hempton and provided courtesy of QuietPlanet.com”. Wave on beach [Nature SFX 23]; bird in flight [wings 3 2012.12.01]; surf line [1999.08]; and spouting horn 3 recorded by Gordon Hempton of QuietPlanet.com. Bird sounds provided by The Macaulay Library of Natural Sounds at the Cornell Lab of Ornithology, Ithaca, New York. “Oo-ah-oo” calls of Hawaiian Petrel  recorded by L. King.